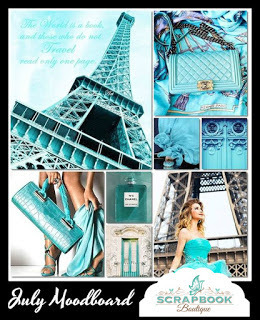 Inspired by the moodboard, I used lots of aqua and some travel-themed bits and pieces. I'll fill the bag with some yummy goodies and give it to her next week. 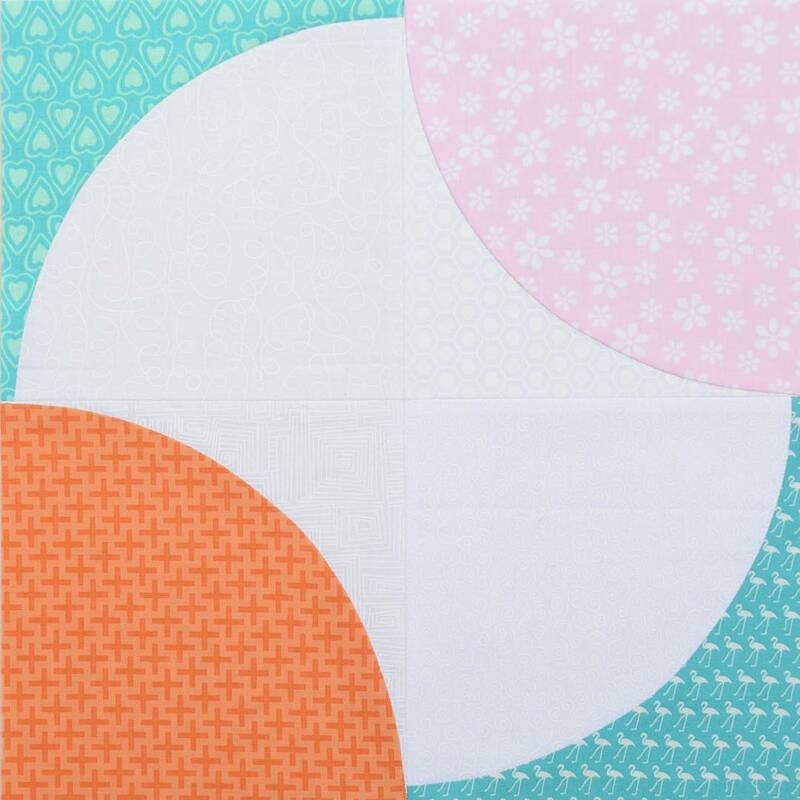 Alison chose the Fizzy block in white, aqua, bright orange and a soft, pale, baby pink. This is my third time making this block (I made it twice for last year's bee) so I am no longed daunted by the curves. Perhaps one day I'll make a whole quilt with curved piecing. I haven't played along with a scrappy challenge for a looong time, but I have two very good reasons for that (and their names are Gregory and Harriet). However, they are now two months old and quite enjoy being in a baby carrier so I've managed to get a bit of scrapbooking done. For this challenge I made a layout documenting the last couple of weeks of my pregnancy, which was not all roses. 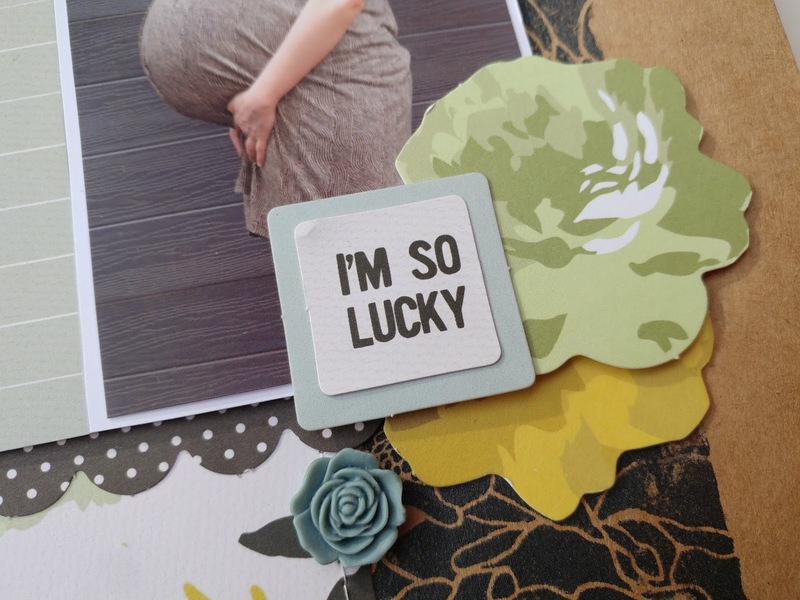 I wanted to document the struggle but also how grateful I was to make it to 36 weeks. My layout uses roses in six different ways. In addition to the word "roses", I've also used a rose patterned paper, rose die cuts, resin roses and some rose washi tape. I also busted out a Heidi Swapp screen printing kit I had never used before and added some screen printed roses to my background. I love how scrappy challenges encourage me to try new techniques and supplies. Fingers crossed I can squeeze in one or two more by the end of the month. 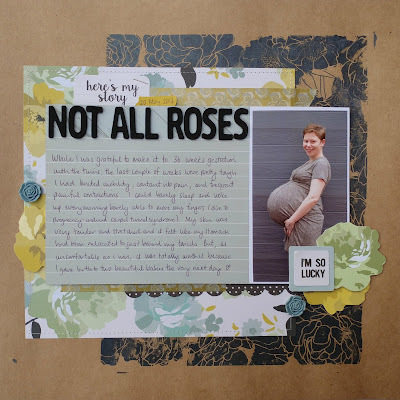 The July mid-month reveal is now up on the SBT50 blog. 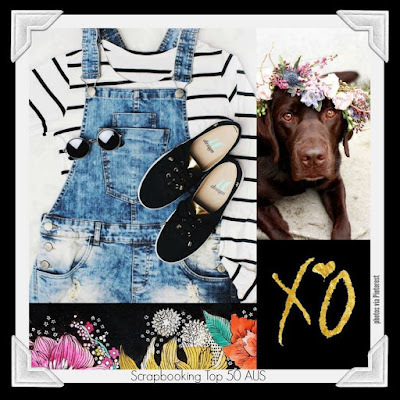 This month we have a pretty mood board to play along with. 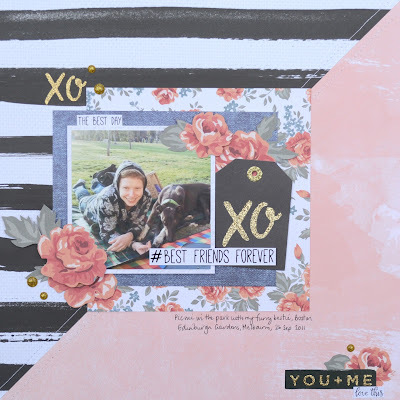 For this challenge I was inspired by the image of the pooch to scrap a photo of my fur baby and I from when we were both quite a bit younger. My outfit also goes quite well with the other main image in the mood board - denim jeans with a black and white top. 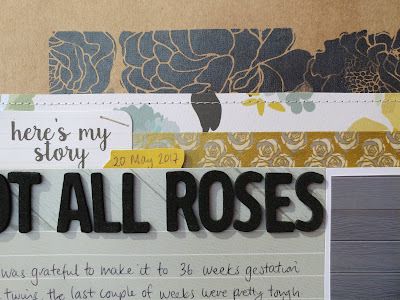 I used mainly papers from the Kaisercraft Boho Dreams collection because they included lots of patterns present in the mood board; a nice black and white stripe, demin print and pretty florals. 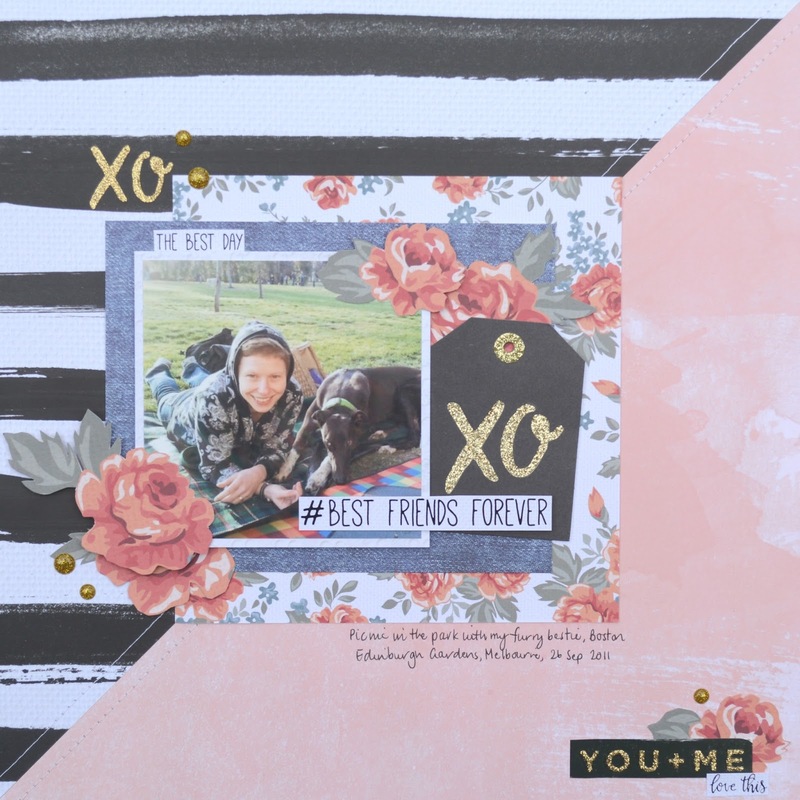 To finish the layout I added some black and gold glitter embellishments from the Crate Paper Hello Love collection. How perfect is that tag! 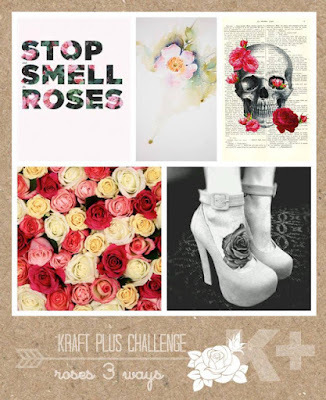 You've got till midnight 31 July to link up your entry and go in the draw to win a $50 prize from ScraphappyKat. We can's wait to see what you create. I'm hoping that quarter three will be just as productive so I'm listing lots of projects (more than I can realistically hope to achieve but I like to keep my options open). Most have just been rolled over from quarter 2, but some have been added in the mean time. 2. Les Fleurs pillow - I made six 6" blocks for the quilt-non sampler earlier this year from prints from the Les Fleurs collection. I'm planning to make three more 6" blocks and turn it into a pillow. 3. Fat eighth storage trays - I've been hunting for the right size tray to store my rainbow fat eighths for a while with no luck so I've decided to make my own using Nicole's (from Lilyella's Stitchery) sturdy fabric basket tutorial. I've finalised the design and have made a prototype. I'm hoping to make a whole series of these (one for each colour). 4. 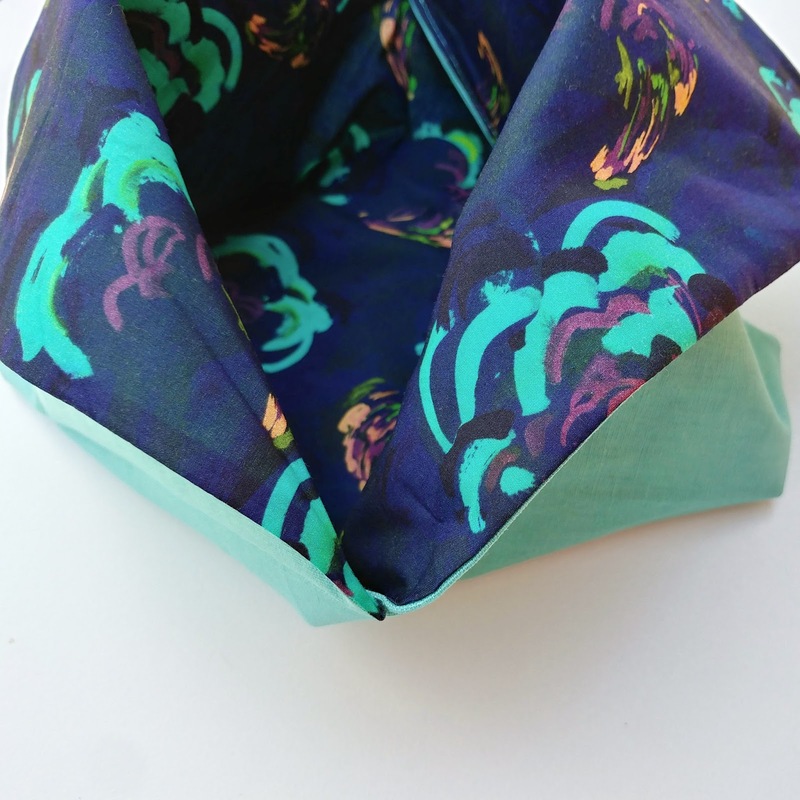 Zip up fabric tray - I've been doing quite a bit of handsewing in bed so thought I'd make myself a zip up tray pouch to keep my supplies tidy by my bedside. I've purchased the pattern, pulled the fabric and cut the interfacing but need to start sewing. 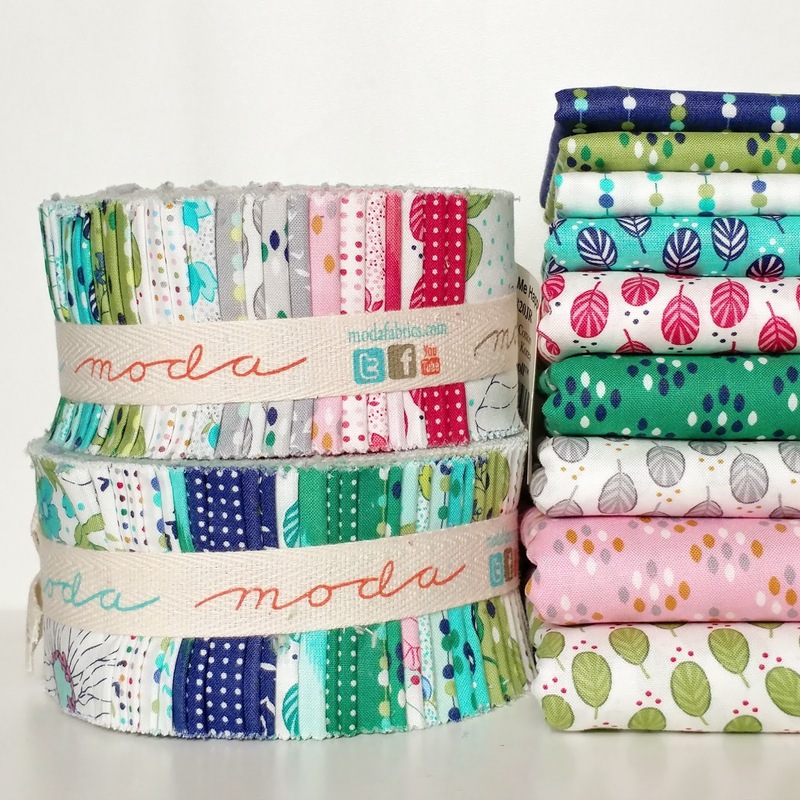 I signed up for a Bonnie and Camille mini barn quilt swap so there are a few projects I need to finish up this quarter. 1. The main mini quilt - I've got the quilt top partially assembled. 2. Mug rugs - I'm making my partner a set of mug rugs based on a few of the Thimble Blossoms mini patterns. I've cut all the pieces I need to make some mini blocks. 3. Basket - I'm planning to make a sturdy fabric basket to hold the mug rugs and have cut a bunch of 2.5" squares for the outer panels. 4. 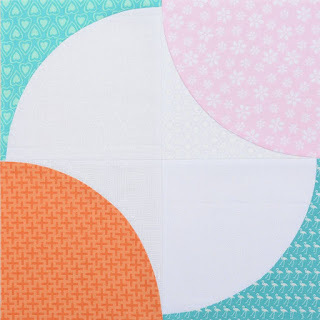 Cross stitch - I'm making a cross stitch swoon block mini hoop as an extra. I've got my materials and have drafted the pattern but need to get stitching. 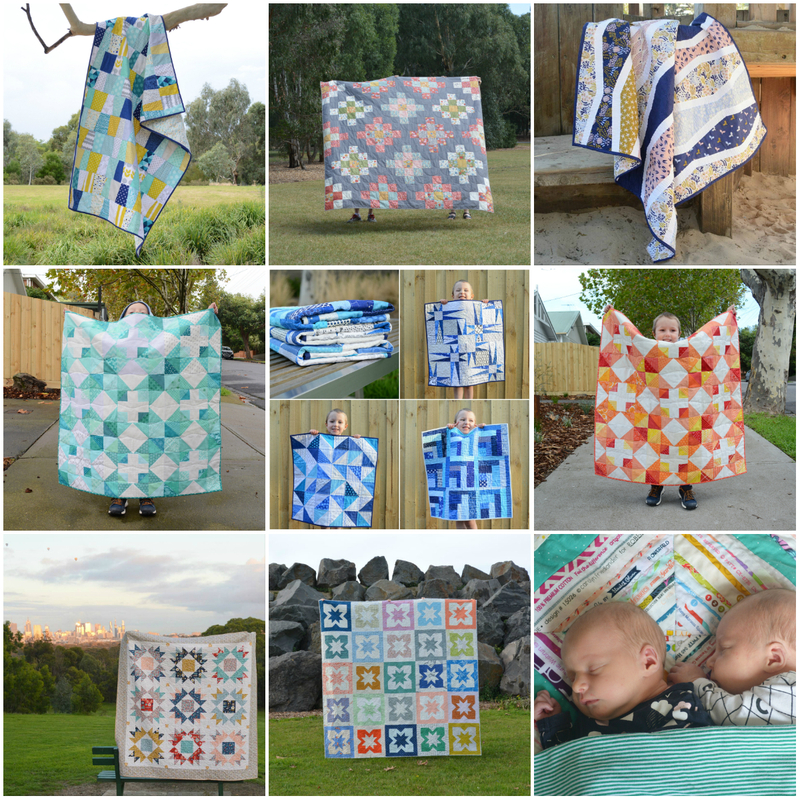 My two little babies have already outgrown the tiny quilts I made for their bassinets so one of the tasks on the top of my to-do list is to finish making their larger quilts. 1. I've turned a couple of test blocks for a scrappy trip around the world quilt into a mini quilt for my little girl. It's basted but needs to be quilted and bound. 2. I'm also making a quilt for my little boy using some leftover hourglass blocks from a quilt I made a few years ago. 3. Frances Firefly mini 1 - While I was pregnant I started making the twins a set of Frances Firefly quilts for when they move into their cots. I've selected the precut strips for the baby girl's quilt and have pieced the first block (through can't find it to photograph). 2. Frances Firefly mini 2 - I've also selected the precut strips for my baby boy's quilt but haven't started sewing yet. 4. Numbers wall hanging - last year I made him a Spell it with Fabric alphabet quilt for his birthday. I've been meaning to use to leftover strips to make him a coordinating wall-hanging with the number blocks. I'd also love to finish a few other little quilts I have on the go. 1. Hazel baby quilt - I'm planning to make a Hazel Hedgehog quilt using prints from the Eastham collection by Denyse Schmidt. I've cut a lot of the pieces but have been waiting for a time when I am not so sleep deprived before I start the complex piecing. 2. Colour me Happy hourglass quilt - One of my friends recently had a little girl so I am making her a quilt; using some precut triangles to make a simple hourglass quilt. I've assembled the hourglass blocks but need to make a date with my rotating mat to get them all trimmed. 3. Moxie quilt - I started this project many years ago and would love to get it finished. I've cut all the pieces and sewn some of the wedges but need to sort out some background fabric before I can continue. 4. Starflower quilt - I made an extra large version of the star flower block for the Honey Pot Bee in January and have plans to turn it into a children's quilt or a play mat for my little ones. I have a weakness for quilt-alongs and tend to join in more than I can possibly keep up with. These are a couple of current quilt alongs that I am hoping to wrap up this quarter. For each of these I have made several blocks and am hoping to be able to keep up. 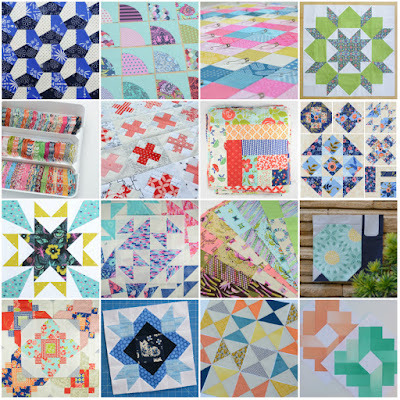 These are projects from previous quilt alongs where I fell off the wagon before the finish line. Most are from earlier this year but the Glisten-a-long WIP goes back to 2015! 1. Freckles quilt - One of my goals for this year is to master curved piecing. I've started making the Tula Pink Freckles quilt but still have a long way to go. 2. Bonnie and Camille log cabin quilt - This is a recurring item on my proposed finishes lists that I never get around to finishing. I've got a lovely pile of log cabin blocks from a swap ready to turn into a quilt. 3. Paradiso Wild Goose Chase quilt - A quilt I started early last year that I hope to finish soon. 4. Selvage quilt - The selvage quilt I finished last year is my all-time favourite quilt and I've already started on another one, this time using a spiderweb block pattern. 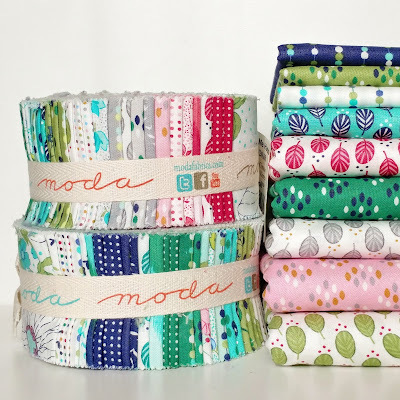 Last week's Sunday Stash share is something that is not new to my stash, but rather something that I have been hoarding for quite a while: a couple of jelly rolls of Color Theory by V&Co for Moda Fabrics and some coordinating yardage. I've pulled these out of hiding because I'm hoping to join a trip around the world sew-along (hosted by Meg of My Tea and Brie) and thought that using precuts would be a better idea for this sleep deprived mama. Most of the sewing that I have done lately has been practical sewing for the babies or gifts for others, so my One Monthly Goal (hosted by Elm Street Quilts) for July is to do some selfish sewing and make a start on this quilt for myself. I'm hoping to have at least four blocks done by the end of the month.